WASHINGTON (Sept. 03, 2013) -- September is suicide awareness month and while the Army will highlight suicide prevention this month, the service's vice chief said the effort is year-round. "This is something we can't just look at in one month," said Vice Chief of Staff of the Army Gen. John F. Campbell. "It has to be a 365-day mission to make sure we can provide our Soldiers with the tools they need to deal with the stressors of everyday life, and help them understand that seeking help is a sign of strength not weakness." September is suicide awareness month and while the Army will highlight suicide prevention this month, the service's vice chief said the effort is year-round. Pictured here, Vice Chief of Staff of the Army Gen. John F. Campbell briefs staffers at the new Headquarters Department of the Army, July 24, 2013, at the Pentagon. Comparing the March through July 2013 time period to the March through July 2012 time period, Army suicides have gone down slightly -- by about 17. But if January and February are included in those numbers, the Army has so far had the same number of suicides this year as it had last year during the same period: 184. In 2012, the Army had a total of 325 suicides. Campbell said he's kept abreast of every suicide in the Army; he knows the numbers, and the Army researches every suicide to try to determine what might be the cause. He said that the trends show that most suicides are the result of financial or relationship issues, often exacerbated by drug and alcohol use. The general said as a way to prevent suicides in the Army, it is critical that commanders and noncommissioned officers know their Soldiers that work for them. And it's important Soldiers know their fellow Soldiers as well. "Much of it is just about knowing your Soldier, knowing if they have a financial issue, if they have gone through a breakup with a girlfriend, or if they have a problem in their marriage," Campbell said. "It's as simple a thing as sitting down and talking to a Soldier. A lot of time a Soldier is going to keep that to himself. The more you can figure out whether a Soldier is higher risk, you will watch them a little bit more closely and make sure they have the resources to get help." Campbell said he saw a Soldier suicide for the first time in the early 1980s, while serving in Germany. He was a lieutenant then. Later, as a brigade commander within the 82d Airborne Division, and then later still as commander of the 101st Airborne Division (Air Assault), there were more suicides among Soldiers in his units. "Not only in garrison but deployed. I've also been in units that had family members who committed suicide," Campbell said. As a company commander at Fort Bragg, N.C., Campbell said, a Soldier hanged himself in his room over a holiday. "The chain of command knew he wasn't going on leave, he'd be sticking around the barracks," Campbell said. "But it was a good 48 hours before somebody really checked in on him and found out that, in fact, his roommate had gone off... and he'd been having some relationship issues." Today, lessons learned from the suicides he experienced early on in his career still stick with Campbell. "What I learned at that time, still stands with me today," he said. "In order to help get at this, you have to know everything about our Soldiers. And our non-commissioned officers have to embrace this, which they are." Having experienced suicides in his own units, and as vice chief of staff of the Army being aware of the number of suicides that occur across the force every day, Campbell said he knows exactly how a single suicide affects everybody who knew that Soldier. "One article I read said that for every suicide, there are 35-plus people impacted," he said. "Whether that is family members or the unit, I am not sure you can put a number on it. Any suicide is tragic. But every one of them does impact the unit, the morale of that unit, that squad. And I just think the more that we can do to keep the focus on what resources are out there for people who are having issues and those stressors that would drive somebody to suicide, then we make those resources available." When leadership is aware of the issues Soldiers are facing, whether it be relationship issues or financial issues or something else entirely, they can direct those Soldiers to the ample support services the Army provides -- especially though the Army's Ready and Resilient Campaign, which serves as an umbrella for hundreds of programs aimed at helping Soldiers resolve the issues that might lead them to consider suicide, and also develop the resiliency they need to be able to handle those challenges. There are many programs available, some that deal with Soldiers, some with families, others that affect various aspects of a Soldier's life and well-being. The Ready and Resilient Campaign is meant to make it easier for Solders to find the right program to help them, and at the same time, R2C will also find efficiencies within the portfolio of programs available. In practical terms, that means some programs will be cut where there is redundancy, and other programs might be merged to make them more efficient. The effect of that will be to create fewer, more effective programs, Campbell said, that cost the Army less money, but at the same time continue to provide Soldiers with the same support the Army has always provided. "At some posts you may have two or three programs that deal with alcohol or drugs that are tied into suicide, and they may not be talking to the same population," Campbell said. "We can't afford to be redundant, and we can't afford not to provide to Soldiers what is important to them. What we are trying to do is take a hard look and have metrics applied to all those programs, and make sure the decisions we make are the best for each of those posts, camps or stations." One part of the Army's Ready and Resilient Campaign the vice chief considers critical is the Comprehensive Soldier and Family Fitness Program, responsible for helping Soldiers learn resilience by either becoming master resilience trainers, or by learning resilience at the unit level through Soldiers who have been through the master resilience trainer, or MRT, course. "I can't stress enough the resiliency piece of it, and this CSF2, tied into MRT," Campbell said. "As I went out and traveled and talked to folks that had gone through the master resilience training ... everybody I've talked to that has been through the MRT has said it has changed their lives and they have been able to impact other Soldiers lives. That's really key." 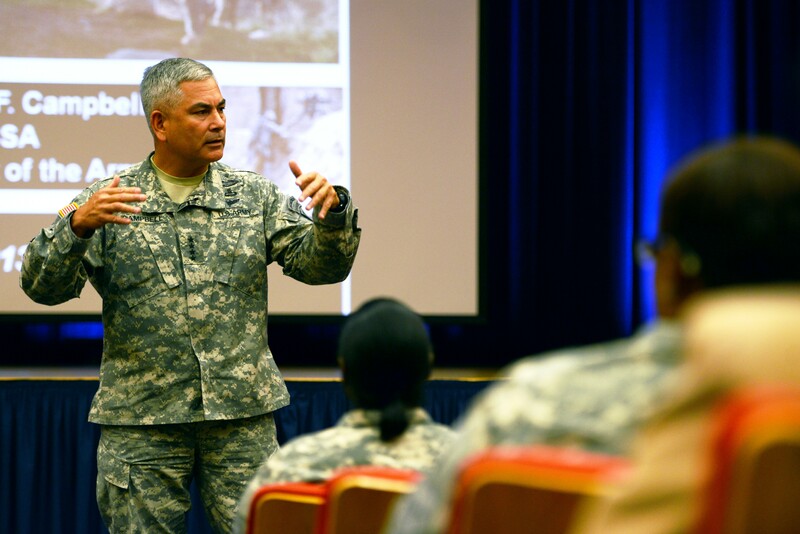 Campbell said the Army is trying to get master resilience trainers down to company level. Right now the Army has about 16,000 personnel who are MRT-qualified, and that number increased both through MRT training at Fort Jackson, at the University of Pennsylvania campus in Philadelphia, and through mobile MRT training teams. Resiliency training is meant to strengthen a Soldier's ability to more effectively deal with the kinds of situations that might affect their ability to do their job, or might even drive them to consider suicide. Resilience training isn't just offered to master resilience trainers -- who are meant to bring those skills back to their unit. Soldiers are getting resilience training as early as basic training and throughout their career, Campbell said. As part of the September suicide awareness month observation, Army senior leadership will sign a tri-signed letter discussing the Army's emphasis on suicide prevention. Campbell also said the Army will provide some flexibility to commanders, allowing them to have a suicide stand-down day if they choose to do so.